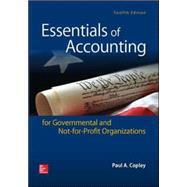 Copley's Essentials of Accounting for Governmental and Not-for-Profit Organizations, 12e is best suited for those professors whose objective is to provide more concise coverage than what is available in larger texts. The main focus of this text is on the preparation of external financial statements which is a challenge for governmental reporting. The approach in this edition is similar to that used in practice. Specifically, day to day events are recorded at the fund level using the basis of accounting for fund financial statements. Governmental activities are recorded using the modified accrual basis. The fund-basis statements are then used as input in the preparation of government-wide statements. The preparation of government-wide statements is presented in an Excel worksheet. "Books came in two separate boxes delivered the same day, everything was there and in good condition"
Essentials of Accounting for Governmental and Not-for-Profit Organizations: 4 out of 5 stars based on 1 user reviews.